Why would anyone undress on stage in the year 2014? In “more than naked”, twenty naked dancers make their flesh wiggle, wobble, and crack. Their bodies slap against each other, sweating and snapping to dance floor hits and lavish sounds. Twenty people on stage are more than a group — they are a society. And this society sets itself in motion. 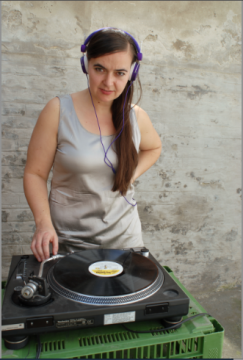 As the movement unfolds, Doris Uhlich stands on stage, DJing to the whole event the motto being “Let’s party our body, let´s rock the flesh!” more than naked manages to bring to the stage nakedness free of ideology and provocation. Doris Uhlich was already occupied with making “her flesh” swing in her previous piece “more then enough”. In the process, she developed a fat-dance technique. “more than naked” is a consistent continuation of this concern with body discourses, and it blasts away conventional ideas of body, dance, and nakedness with tremendous subversiveness. Choreography: Doris Uhlich. Dramaturgical collaborator: Christine Standfest. Performance: Zinzi Buchanan, Neil Callaghan, Mihaela Alexandra Dancs, Andreea Maria David, Ewa Dziarnowska, Lucia Di Pietro, Stefanie Eisl, Aleksandar Georgiev, Tova Gerge, Katharina Hölzl, Ofelia Jarl Ortega, Costas Kekis, Petros Konnaris, Lilach Livne, Milan Loviska, Andrius Mulokas, Katarzyna Szugajew, Andrew Tay, Thales Weilinger & Sebastian Zuber. Production: Christine Sbaschnigg & Theresa Rauter (Theaterverein) & ImPulsTanz Vienna. With the support of WUK perfoming arts. The dancers in the project were participants in the more than naked workshop, which Doris Uhlich gave in 2012 at ImPulsTanz. The group had the vision of meeting again and collaborating to create the piece more than naked. MDT presents Doris Uhlich as a part of and in collaboration with the Stockholm Music and Arts festival by Luger. “more than naked” is ongoing all Saturday with performance peaks at 15:00 and 21:00. For more info on the festival please click here.